Ice Dams and Vinyl Roof Decks: Should You Be Concerned? With all the heavy snows, melting and freezing that is inevitably on its way (brrr), there’s a good chance that many vinyl roof deck owners will be dealing with ice dams this winter – so what can you do? Luckily, Tuff Industries has the answers to helping deal with vinyl roof decks and ice dams. Understanding how ice dams occur can help you prevent them on and over vinyl roof decks. When snow falls, accumulates, and then melts, the resulting water runs towards the edge of the roof (or gutter). Ideally, the snow continues to melt, and all the water flows from the edge of the deck and down the gutters and away from your home. Unfortunately, if the temperature drops in the meantime the water freezes into ice again. As more snow melts, the water becomes trapped behind the initial dam of ice. This can lead to the snow/water refreezing, which can cause serious issues to roof structures, shingles, and vinyl roof decks by forcing its way back up the slope and under the surface. If you already have an ice dam it can it can be hard to fix the problem during the winter season, you’ll likely have to wait until everything melts and deal with the issue (and any resulting damage) in the spring. However, in the meantime you can clear any build up of snow off your roof/vinyl roof deck with a broom, so the ice dam doesn’t worsen. One common problem that can lead to ice dams under or above vinyl roof decks is poor insulation in your attic. This can allow heat to escape, melting the snow from underneath. Improving insulation in your attic can help reduce the problem by keeping heat in, as well as saving you money – always a plus. Ensuring your gutters are clean at the beginning of winter helps to remove water from the vinyl deck roof structure quickly when the snow begins to melt. Additionally, you can easily install heating cables along the edge of your roof to help the snow keep melting, rather than refreezing and backing up along the roof. If you have a heavy snow it’s a good idea to check any attic vents you have – they help air to circulate from your attic, but it won’t do you much good if they are buried in snow. For your roof deck surface, if water isn’t flowing off the edge it can be a sign of more trouble down the road, as standing water can find its way under the edge of the deck or pool against the walls of your home. After the snow has melted, you mi,might want to have a thorough inspection completed to take care of any vinyl roof deck issues before they cause damage to the roof structure. When an ice dam forms, it can creep up underneath the roof structure and adhere to the shingles. If you try to knock off the ice dam, it could damage the shingles or even part of the roof – try to avoid the temptation. If the ice dam overhangs your vinyl roof deck, place a heavy tarp under the overhang so falling ice doesn’t damage the vinyl membrane. Get professional help if you need it. Once the temperature is above freezing, you can use a hose to melt channels in the snow on your roof, so that melted snow can reach the gutter. Another neat trick is to fill the legs of pantyhose with calcium chloride (a common de-icing agent), tie off the ends and lay the “legs” on the roof, perpendicular to the edge of the roof with a bit overhanging. The calcium chloride will melt the snow and create a point for water to leave the roof without freezing. If your roof or vinyl roof deck has had ice dam issues over the winter, you’ll want to have everything inspected once the snow fully melts. It’s vital that you get any damage repair as soon as possible – before more water has the opportunity to access the underside of the roof or your roof deck. Have a professional take a look if you’re not sure. 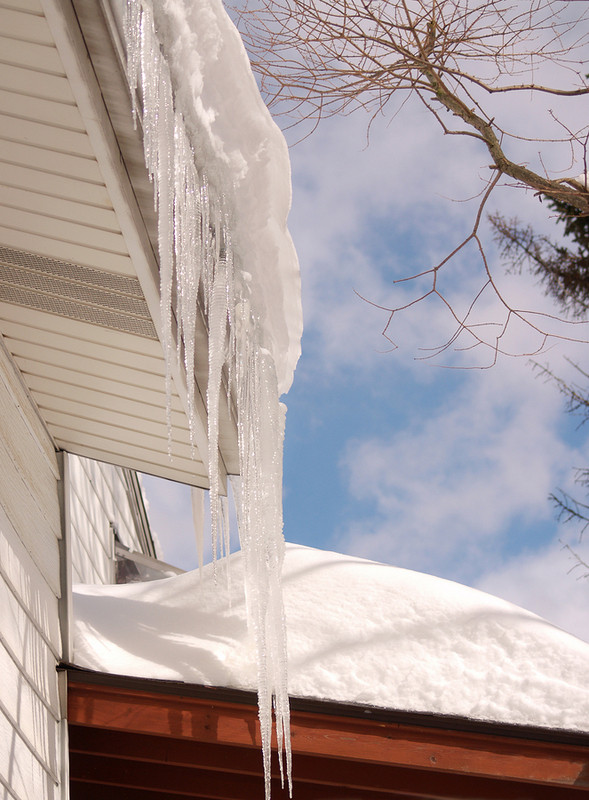 Ice dams can be a pain – the key is to not let them continue to cause problems or damage to your roof or vinyl roof deck.